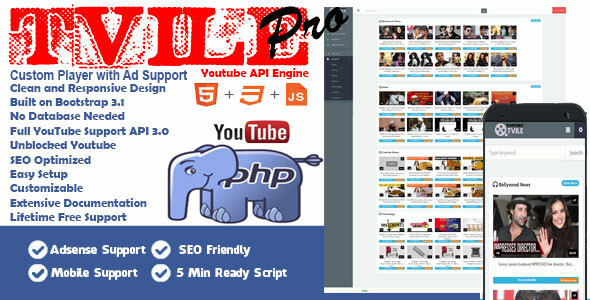 TVILE Youtube APi Engine Pro is a simple and powerful media script that lets you build your online media site in under five minute. It is powered by YouTube and it is fully automated so you don’t need to do anything. It features popular YouTube videos, channels and user profiles. You can also easily monetize this by adding your advertisement code. Just Change your Graphics, Update a Config.php and Auth login.php, integrate a adsense. No Code Difficulty all the things are include in documentation folder of Package with screenshots.